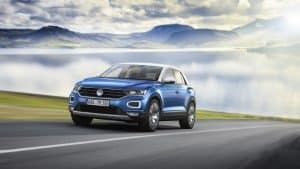 Volkswagen has revealed an all-new compact crossover SUV called T-Roc, due to go on sale in the UK later this year. Prices are expected to start from around £19,000, which places it as a direct rival to the Mazda CX-3 and Mini Countryman. It will sit on the same MQB platform as the Golf and other super-successful VW Group models such as the Audi A3 and SEAT Leon. Buyers will be able to choose from six engines, two gearboxes and either front or all-wheel drive. Petrol options will include the entry-level 113bhp single-litre TSI turbo petrol and a 1.5-litre TSI Evo unit with 148bhp and cylinder deactivation, as well as a two-litre option with 197bhp. There will be a trio of TDI diesels too: a 113bhp 1.6-litre unit, mated to a six-speed manual gearbox, a 148bhp two-litre block and finally, a range-topping two-litre engine with 197bhp that comes only as an automatic with all-wheel drive. A single glance at the T-Roc is enough to confirm its similarity to its larger Tiguan sibling, and from the front, it’s planted very firmly in familiar VW territory. However, look closer and you’ll notice a smoother coupe-like roofline and begin to appreciate its slighter dimensions – compared to the Tiguan, it is 25cm shorter in length and 8cm lower. The cabin has been stuffed with a lot of technology from the Golf too, but this time, it has been given a unique spin with bright, funky panels in a bid to appeal to a younger audience. Key features the T-Roc borrows from the Golf include the steering wheel, the touchscreen, the air-con controls, the gearbox and handbrake lever and the side door. The main difference is the driver will sit higher. The T-Roc will be marginally more practical than the Audi Q2 – its VW Group rival – with just 40 litres more boot space (445), opening up to 1,290 litres with the rear seats down. If you were wondering about the name, the ‘T’ keeps in line with VW’s tradition for SUVs beginning with the letter T, while the ‘Roc’ part signifies how it is going to shake up or rock the compact SUV segment. You will be able to order one from October.